The ionization energy (IE) or ionization potential is the energy needed to remove an electron from an atom in the gaseous state. Since one, two or more electrons can be removed from an atom, many ionization energy is possible of that atom. The first ionization energy (IE1) is the energy needed to remove the first electron from the atom in gaseous state. The second ionization energy (IE2) is the energy needed to remove the second electron from the atom in gaseous state. The higher ionization energies are also possible for an atom in gaseous state. The second ionization energy (IE2) is always larger than the first ionization energy (IE1) as it is hard to remove an electron from a positive atomic ion than a neutral atom. The third ionization energy (IE3) is also larger than the second one (IE2). Thus in general successive ionization energies increase in magnitude IE1<IE2<IE3<IE4 and so on. The first ionization energy of atoms in the periodic table increases across the period and decreases down the group. Moving from left to right across a period, the number of protons and electrons increases while the number of energy shells stay same. Thus because of more attraction between increasing number of positive nucleus and negative electrons, the more energy is needed to remove an electron from successive atoms. Thus the first ionization energy increases across the period. Moving down a group, the number of energy shells also increases with the increase of protons and electrons. So because of shielding effects of electrons in the increased inner shells, the attraction between electrons and nucleus is reduced down the group. As a result the first ionization energy is also decreases down the group in periodic. 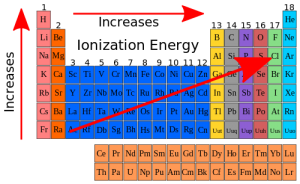 Though the increase in ionization energy is found across the period in periodic table but exceptions are with decrease in ionization energy across the period 2 and 3 between groups 2 and 3, and 5 and 6 elements (Be>B, Mg>Al, N>O and P>S). This can be explained by the electronic configuration of beryllium and boron. h is a slightly higher energy than 2s orbital. This means the distance between the nucleus and the outer electron in boron is more than beryllium. At the same time the shielding effect also increased in boron. The increased distance and shielding effect in boron, results a reduced attraction and so a reduced ionization energy. For the same reason the decrease is also observed between magnesium and aluminium. In this case the one extra electron in aluminium goes to 3p orbital. Due to the increased distance and shielding effect, the attraction of outermost electron in aluminium experiences less attraction towards nucleus and thus the ionization energy decreases. The outermost electron in both nitrogen and oxygen is being removed from an identical orbital 2p. The difference is that in oxygen the outer electron is being removed from a pair of electrons in 2px2. The repulsion between the two electrons in the same orbital results the easy removal of electron from that orbital. Thus less energy required to remove that electron and less ionization energy. The ionization energy (IE) is the energy needed to remove an electron from an atom in the gaseous state. In general successive ionization energies increase in magnitude IE1<IE2<IE3<IE4 and so on. Exceptions are with decrease in ionization energy across the period 2 and 3 between groups 2 and 3, and 5 and 6 elements (Be>B, Mg>Al, N>O and P>S).